Good morning. Today is the final day with Guest Designer Cindy Lawrence. It has been such a pleasure having Cindy with us for these past 3 days. Her projects have been amazing!! Be sure to check out Cindy's blog for even more inspiration. and final day as guest blogger for JustRite this month. I’ve had such fun playing with JustRite stamps. layer die-cut with a Spellbinders Classic Ovals die. heart-warming sentiment with Memento Tuxedo Black ink on a bit of patterned paper. The base layer was die-cut with a Spellbinders Teardrop Circles die. That’s a lot of layers! ink, and stamped the sentiment and corner elements in Memento Tuxedo Black ink. me! Have a fantastic Wednesday! Welcome to Day Two of the JustRite Papercraft Winter CHA 2013 Release!! All of the stamp sets in our CHA Release are in stock and shipping. Today we are introducing a fun new 6" x 8"clear stamp set Live, Love, Laugh Vintage Labels Two designed to coordinate with our new nested Vintage Labels Two Dies. You will have so much fun using the 30 stamp elements in this set. Plus you will see sneak peeks of one of four new background stamps we are releasing for CHA too! Vintage Labels Two Dies This die is in stock and shipping!! Barb Schram designed this fun card by stamping in white on black the word labels from Live, Love, Laugh Vintage Labels Two to create a chalkboard inspired background paper for her Sunshine and Laughter card. Eva Dobilas designed this bright and cheerful card using Live, Love, Laugh Vintage Labels Two die cut with Vintage Labels Two Dies. Wouldn't receiving this card just make you smile? Marisa Job designed this gorgeous card using Live, Love, Laugh Vintage Labels Two die cut with Vintage Labels Two Dies. that Amy Tedder cleverly placed in the largest Vintage Two Label Stamp (allowing you to design the large label yourself by picking your favorite label words or the fun embellishment if you want to leave it blank). Kathy Jones used the small banner elements in Live, Love, Laugh Vintage Labels Two, to create a bunting in the corner of her card design. Kathy also used dies from both Vintage Labels Two Dies and Vintage Labels Four Dies to create the layers for her card. Kathy is also showcasing one of our new CHA Release background stamp called Floral Flourishes Background. Angela Barkhouse is working on her daughters 8" x 8" wedding scrapbook album and she incorporated one of the Live, Love, Laugh Vintage Labels Two sentiments to her page and created the background paper using our new CHA Release Floral Flourishes Background. Thanks for stopping by!! Join us tomorrow for Day 3! JustRite Friday Challenge 047: Love Is In The Air! Welcome to another JustRite Friday Challenge! This week here at JustRite Stampers, Love Is In The Air! That's right, for this challenge we want to see your JustRite projects with the theme of love, wedding, anniversary. We can't wait to see your projects! This challenge is sponsored by the Stamp Simply Ribbon Store. The owner of the Stamp Simply Ribbon Store is JustRite design team member alumni, Sharon Johnson. Sharon was JustRite's second design team member, way back in 2008, so she has tons of experience using JustRite's stamps and always wows us with her creations! Sharon carries all the latest and greatest papercrafting products in her store, besides a plethora of wonderful ribbons, including JustRite stamps! 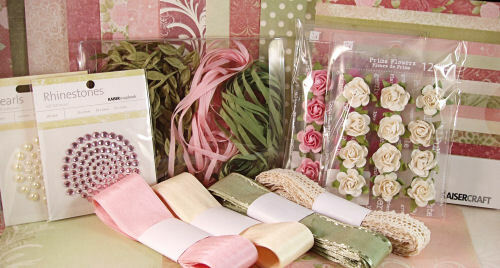 One grand prize winner of JustRite Friday Challenge #047 will receive this fabulous Stamp Simply Ribbon Store exclusive KaiserCraft English Rose kit valued at $44.50! In addition, the grand prize winner will also receive JustRite Stampers' new Kindness cling stamp set, Mini Binder Cling Storage Box, and a set of our 3 Acrylic Blocks ($38.85 combined retail value)! Three Honorable Mention winners will receive our Fancy Frames cling stamp set, a $19.95 value! 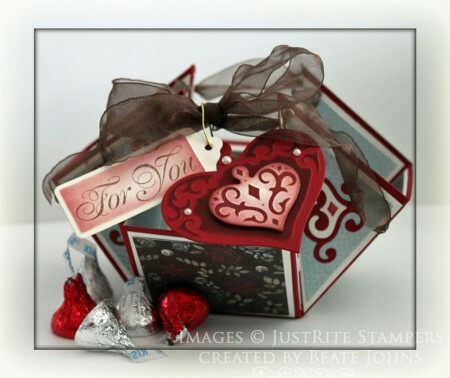 As an added bonus, the Stamp Simply Ribbon Store designers have "love" projects to inspire you today. Be sure to click on their hyperlinked names to be taken to their blog posts with full details of their fabulous JustRite love projects! You will need to use JustRite products for your project and upload it to an online blog, gallery or photo hosting website. You may make and enter as many different projects as you'd like for our challenges. You will then need to link to your project back here on our blog post, using the linking system on this challenge post. Please make certain your link is directly to your project, not just your general blog home page or overall photo gallery, so we can find it easily. (Links that are spam, commercial in content, or are not linked properly/directly to your project will be deleted). If you choose to upload your project to www.Splitcoaststampers.com OR our Flickr gallery, please use the weekly challenge code (example: JRC_047 <== that's an underscore between the letters and numbers) in the keyword section of the Splitcoast project upload page or the tag section of the Flickr gallery. You will have until Thursday, February 3 at 8:00am Central to make your project and enter a link to it below. Winners will be chosen and announced later that day (Thursday, February 3rd) here on the JustRite Inspiration Blog. Please allow up to 4 weeks for delivery of your prizes. By entering our challenges, you grant JustRite Stampers permission to use your artwork here on our blog as well as our company website gallery (with designer credit given and your blog post or gallery linked) or any possible advertising. We can't wait to see your Love projects!